Former heavyweight world title challenger Chris Arreola is picking Julio Cesar Chavez Jr to defeat Saul Canelo Alvarez by a knockout this Saturday night in their fight on HBO pay-per-view at the T-Mobile Arena in Las Vegas, Nevada. Arreola believes that Chavez Jr. has size, power and importantly the conditioning to defeat the popular redheaded Golden Boy star Canelo Alvarez. Arreola says that Chavez Jr. took the weight off the right way in getting down to the 164 ½ pound catchweight for the Canelo fight on Saturday. Arreola has seen recent pictures of the 31-year-old Chavez Jr. and he thinks he looks in excellent shape, and not weight-drained or dried out like he’s looked in the past in making weight for his fights. This is bad news for Canelo, because he wasn’t able to knockout the much smaller 5’7” Miguel Cotto in his last tough fight in 2015. Canelo appeared to be 15-20 pounds heavier than Cotto, and his punches had zero effect on him. On Saturday night, Canelo will be getting hit by the bigger Chavez Jr. and this could take its toll on him before long. “I’m taking Chavez, and the reason I’m taking Chavez is because he took the right time to lose the weight properly,” said former heavyweight world title challenger Chris Arreola to Fighthype.com. “I’m looking forward to a great fight. I’m picking Chavez in an upset. I think he’s going to stop him. I do see him stopping him in the later rounds. This is the way I see him winning. Probably Canelo will get the first 2 or 3 rounds, and Chavez is going to warm up. He always starts up late, but he better warm up sooner rather than later. The size is the main thing. Canelo couldn’t drop Cotto, and Cotto’s not that big of a fighter. Cotto did hit him with some good shots. He caught him a couple of times. I hope Cotto is in the great boxing shape that I think he is, and Nacho [Beristain] is going to make the difference that I think he will make,” said Arreola. A knockout win for Chavez Jr. would be a big defeat for Canelo and especially for his promoters at Golden Boy. They don’t have another Canelo coming down the pipeline. Golden Boy does have a lot of great fighters, but none that match the appeal that Canelo has. It’s hard to understand what specifically makes Canelo so popular to his boxing fans. There are arguably better fighters than Canelo like Jermall Charlo, Gennady Golovkin, Jermell Charlo, Demetrius Andrade and Daniel Jacobs. But for some reason, Canelo has a huge following without him having ever proven that he deserves it. Canelo still hasn’t beaten a talented fighter in his prime and the same size as him. Cotto was old and small when Canelo beat him. It was a size and age mismatch. Golovkin is talented, but Canelo and Golden Boy have been slow in making that fight. “In order for them to rule the Mexican boxing fans, they both have to bring it,” said Arreola about Canelo and Chavez Jr.
“Boxing is a business. Careers aren’t that long,” said Arreola in explaining why Canelo still hasn’t fought Gennady Golovkin. “That’s the reason why he took Chavez over Gennady. Golovkin right now is in his prime. He’s peaking right now. Chavez seems like he’s in his downfall, but we’ll see what happens this Saturday. That’s the reason why they took him,” said Arreola in explaining why Canelo’s promoters at Golden Boy selected Chavez Jr. over Golovkin. “I think so. As much as they want to say, ‘I’ll fight him,’ but the promoters say different. 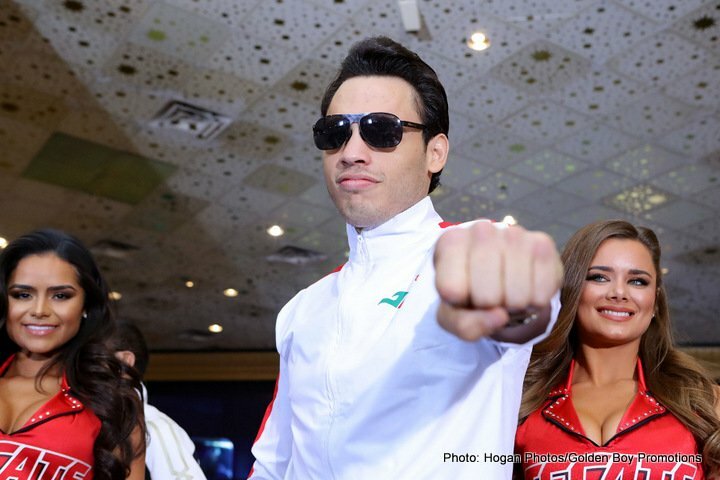 The promoters are looking out for their pockets and their best interests,” said Arreola in discussing why Golden Boy Promotions hand-picked Chavez Jr. for Canelo to fight instead of the much more dangerous Gennady Golovkin. “My power will be the same in the later rounds as it is in the earlier rounds,” said Canelo in telling the boxing media that he will NOT gas out against Chavez Jr. in the later rounds. “I won’t lose power. Fatigue is part of the rounds. I feel good, and I feel strong. Look, we’ll see on Saturday night how I feel. When I fought Mayweather, I wanted to beat the best in order to be the best. I was very motivated, and it wasn’t my night. It didn’t go my way. But I stayed motivated, looking forward, building my career. This fight on Saturday night is very important for me. I’m honored. It’s a proud moment that two Mexicans in the world of boxing at a standstill will have the attention on the U.S for this platform, and show what can be done,” said Canelo.